Two weeks ago a science paper appeared claiming that once various systematic errors in the sea surface temperature are corrected for, the global warming “hiatus” is gone. Yep, vanished as if it was never there. According to the study, temperatures over the past 18 years or so have in fact continued rising as they did in the preceding decades. This meddling and adjustments of datasets was discussed elsewhere (e.g., on watts up with that). Here’s my two pennies worth opinion of it. The first thing to note is that half a dozen other global surface temperature reconstructions do show a “hiatus”. Although it doesn’t invalidate the analysis (science is not a democracy!) it does raise an eyebrow, and should therefore be considered very cautiously. The second thing to note is that this result wasn’t obtained because they considered any new data, instead, they adjusted systematic corrections to different datasets and their respective weights. This is very dangerous. Even if it isn’t deliberate, there is a tendency for people to look (and force) corrections that might push results towards preferable directions, in this case to eliminate the “hiatus” and ignore corrections that could do the opposite. I am not saying this is the case, but I wouldn’t be surprised if it is. In any case, when adding inhomogeneous datasets (different buoys and ship intakes) that fact that different weights gives a different behavior (i.e., the existence or lack of a “hiatus”) is an indicator that the datasets are not added together properly! It is a sign that something is suspicious. 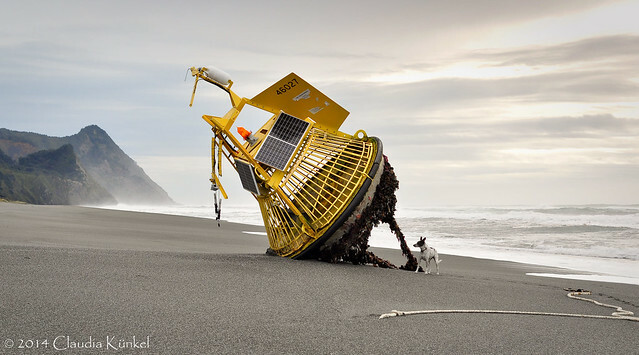 A NOAA buoy swept ashore. Sea surface data was reconstructed with buoys as well as ship intakes. Since they measure water at different depths (and time varying average depth for the ship intake), systematic corrections have to be applied, but how large are they really? Irrespective of the above (which should be regarded as caution signs), perhaps the most important discrepancy between the new surface temperature reconstruction and any dataset is with the satellite measurements. This is because the satellite measurements (which measure the atmospheric temperature and not directly the surface) have shown very little warming. So, if we are to accept the lack of any hiatus as real, we have to accept that the surface warmed much more than the atmosphere did. However, this is counter to any predictions of greenhouse warming. Greenhouse warming works by making the atmosphere more opaque to the infrared radiation. This implies that the effective layer from which radiation can escape back to infinity will reside higher in the atmosphere when more greenhouse gases are present, and since the atmosphere needs a typical temperature gradient to advect the energy from the surface to that emitting layer, the temperature all along the atmosphere has to increase. You can read more about it in Douglass et al. 2007 and see the figure below. Thus, increasing the surface temperature even more but removing the “hiatus” only aggravates the discrepancy! In other words, to really remove the “hiatus”, the NOAA people have to fiddle with the satellite data, not with sea surface data. The warming vs. altitude, from Douglass et al. 2007. One can readily see that the atmosphere heats less than the surface and less than climate models typically predict. Increasing the warming at the surface only aggravates the discrepancy. Last, hiatus or not, the whole discussion diverts everyone from the real problem that alarmists have. Even with the hiatus removed, the “larger” warming of about 0.1°C per decade is still much smaller than the range of predictions standard models make, implying that the models significantly overestimate climate sensitivity and therefore significantly overestimate future warming. For example, as you can see here, a warming of 0.1°C/decade (i.e., 0.35°C over the 35 years of the graph) barely reaches the lower slope of the IPCC predictions. In any case, the whole story reminded me of the hockey stick. One day we woke up in the morning and suddenly there was no medieval warm period and therefore no little ice age. The IPCC had a field day over it. It was the star of the third assessment report. We all know what happened afterwards with the climategate e-mails. I don’t know how this present story will unfold, but my suspicion is that the community and hopefully the public will be more cautious this time, but who knows. Don't let them control your future or your past!